Here is a mini festival to the wonderful pig that was derived from simply using up stuff in the fridge. 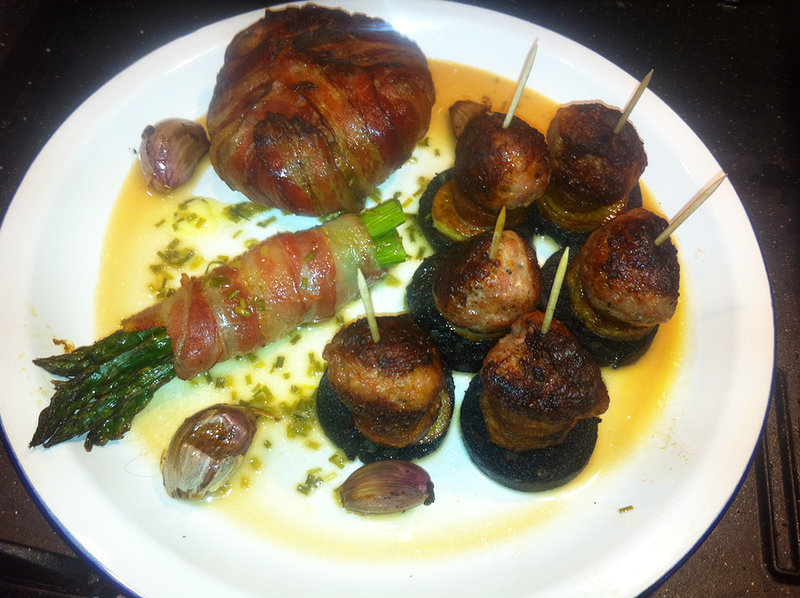 Mini pork towers comprising of black pudding, a slice of new potato, chorizo and a ball of sausage meat, bacon wrapped asparagus, pork liver paté stuffed mushrooms also wrapped in bacon, roasted garlic and a cider sauce. The mushrooms were based on the success of the Garlicky Cheese Stuffed Mushrooms we did the other night. Chorizo, skinned and cut into 1cm slices. 1. In a pan get a bottle of cider boiling to reduce. 2. Pull the stalk out of the mushroom (don't throw it away, keep it as you might be making a gravy or sauce later and the stalks are full of flavour). 3. Stuff the 'shroom with the paté. 4. Wrap with the bacon and secure with a wooden cocktail stick. A good tip is to soak the cocktail sticks in water for half an hour beforehand so they don't burn so much. 5. Shove in the oven on top shelf on gas 6. 6. Wrap 4 or 5 asparagus spears with a rasher or 2 of bacon and place in the oven on bottom shelf. 7. In a small oven dish drizzle the garlic cloves with oil and put in the oven on the bottom shelf. 8. 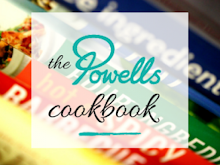 Brown the meatballs in a frying pan then place on the bottom shelf of the oven. 9. Sauté the potato slices in the same frying pan then place on top shelf of the oven. 10. Fry the chorizo and black pudding until done. 12. Everything should be just about done now so make your towers and plate up.